As I’ve noted here before, the Federal Trade Commission (FTC) has an ongoing proceeding asking “How Will Journalism Survive the Internet Age?” The agency has hosted two workshops on the issue and a third is scheduled for June 15th at the National Press Club. Recently, the FTC released a 47-page staff discussion draft entitled “Potential Policy Recommendations to Support the Reinvention of Journalism,” which outlines dozens of proposals that have been set forth in recent years to “save journalism,” “reinvent media,” or support various forms of so-called “public interest programming.” [I’ve embedded the document down below.] Although the FTC makes it very clear on the first page of the discussion draft that it “does not represent final conclusions or recommendations by the Commission or FTC staff [and] it is solely for purposes of discussion,” the document is drawing scrutiny and raising concern since it might foreshadow where the FTC (and Obama Administration) could be heading on this front. Some of those raising a stink about the FTC draft include: Jeff Jarvis (“FTC Protects Journalism’s Past“); Rob Port (“Federal Government Considering “iPad Tax” To Subsidize Journalism“); Mark Tapscott: “(Will Journalists Wake up in Time to Save Journalism from Obama’s FTC?”); and Andrew Malcolm of the Los Angeles Times (“Obama’s FTC Plan to Reinvent America’s News Media“), who says, “this FTC study is rated R for anyone who thinks the federal government, the object of copious news coverage itself, has no business deciding which sectors of the private media business survive and thrive through its support, subsidies and encouragement with things like tax incentives. Yet that’s what this Obama administration paper is suggesting as another of the ex-community organizer’s galactic reform plans.” Ouch! I’ve spent a great deal of time considering many of the “reform” proposals that the FTC outlines in its discussion draft and, along with Berin Szoka, recently released a 5-part series of papers and filed 80 pages of comments with the Federal Communications Commission (FCC) in its “Future of Media” proceeding, which shares much in common with the FTC’s “Will Journalism Survive?” proceeding. 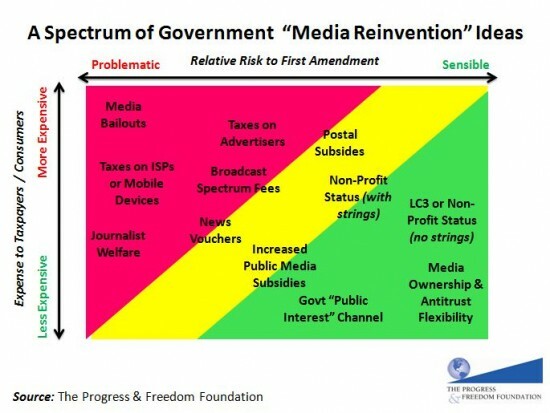 Not all of the ideas floated in the FTC’s draft document are toxic, but some are very troubling and fit squarely in the red or yellow zone of that chart above, which plots a range of media policy options that the FTC or FCC might pursue. McChesney and his Free Press disciples have called for a “post-corporate” media world in which the state essentially serves as both a benefactor and partner of the press. Their “public option” for the press would essentially upend private media and toss the First Amendment into the dustbin of history. I encourage everyone who thinks I am exaggerating to read Chapter 4 (“Subsidizing Democracy”) of McChesney’s new book with John Nichols, The Death and Life of American Journalism as well as the “National Journalism Strategy” that Free Press released last year. Those two works read like a Soviet-style 5-Year Plan for the Press. Massive subsidies. Massive taxes. Massive state meddling into virtually every aspect of the media marketplace and journalistic profession. And if, after reading those documents, you still don’t think they are out to destroy the private provision of media in America, you might want to check out this interview McChesney did with the Canadian-based “Socialist Project” in which he confessed that “the ultimate goal is to get rid of the media capitalists,” and noted that, “unless you make significant changes in the media, it will be vastly more difficult to have a revolution.” Similarly, in his book with Nichols, he concludes by noting that “We have responded in a time of crisis not with tinkering reforms but with revolution.” They sure have! For some reason, the FTC seems enamored with these dangerous ideas. McChesney and Free Press are cited over a dozen times and their proposals show up almost verbatim throughout the FTC’s discussion draft. Moreover, McChesney was recently invited to one of the FTC’s workshops to deliver a major address on these issues. Finally, what makes me particularly nervous is that Susan DeSanti, the person running the FTC’s effort, has praised McChesney and Nichols’ “excellent book” despite its call for radical steps that would essentially hobble private media and impose crushing taxes on just about everyone in sight to subsidize public, state-blessed media. I sincerely hope that the FTC’s “discussion draft” is just that, and nothing more. I’m fine with discussing kooky Marxist ideas all day long. I just hope our government isn’t getting ready to start imposing them upon us.